GLENDALE, Ohio — It’s not unusual for large school groups to visit the Cincinnati Zoo and Botanical Gardens for field trips. 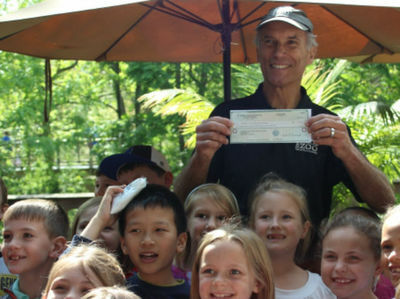 But last Friday, about 40 enthusiastic students, parents and teachers from St. Gabriel Consolidated School arrived with an added agenda — to present the zoo with a check. It was the culmination of their ‘conZOOvation’ efforts. To raise both funds and awareness, the Glendale school sponsored a ‘penny war’ and a ‘no spend day’ to help educate students about conservation while at the same time contributing to a cause. Students raised more than $2,700 total. The theme of ‘conZOOvation’ came about while planning this year’s primary grade science night, explained St. Gabriel Principal Nicole Brainard. As conservation exists on so many levels, she wanted to demonstrate the positive impact conservation of finances can have on the environment. Because grades one through eight participated in the event, she said she wanted to come up with a financial concept that all students, regardless of age, could comprehend. While their sixth graders may have won the war, she said the entire school as well as parents pooled resources for their other event, ‘no spend day.’ For one day, they encouraged students and adults alike to pack their lunch or skip Starbucks and other treats, instead donating that money to the zoo. “Our cafeteria had a very light day that day because everybody packed their lunch,” she said. With all the zoo-themed events, Brainard sent an invitation to Cincinnati Zoo Director Thane Maynard to act as guest speaker at their primary grade science night. Never dreaming he would accept, Brainard said she and the other teachers were elated when Maynard not only confirmed, but brought a couple friends along from the zoo — a baby alligator and a hairy red screaming armadillo. Students decorated the entire school in conservation-themed projects, Brainard said, including a floor-to-ceiling topographical map of Africa that illustrated all of the continent’s nature preserves. She said one second grader dressed from head to toe in cheetah print, while a fourth grader who listens to the 90 Second Naturalist every morning got a chance to meet the show’s host, (Maynard) in person. “They didn’t just have science night, they really brought it,” Maynard said. “They had different classrooms, kids giving presentations and projects they’ve been doing on different ecosystems. The energy in the place was great. You got the real sense that it’s a learning community. As zoo director, Maynard admitted his schedule rarely permits time to speak to large groups, let alone primary school kids. He said he was especially excited to connect not only with these young children, but also their parents that sustaining the environment is a concept that begins at home and in the community. 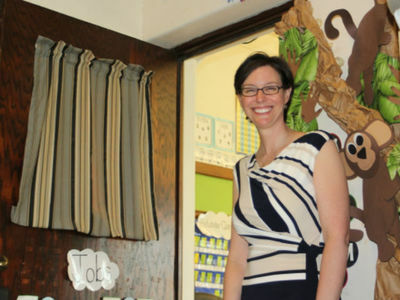 The sense of community at St. Gabe’s takes kids to the next level, Brainard said, with teachers and parents alike excited about participating in events instead of dreading them. She credits her staff and the students themselves for helping to elevate learning. “There’s a high bar that we set, but that’s one the kids set for themselves, that the parents set for their children and that’s trickles through and they want to learn, so there’s a hunger for knowledge.,” she said. In order to help spread their message to others, Brainard said they created a Twitter hash tag at #conzoovation. She said she’s happy to put the challenge out to other schools to match or exceed St. Gabe’s totals as the end result ultimately benefits everyone involved. “If our little kids were able to conserve financially in their way, surely as adults we could pull it off for one day and send that money to the zoo, because what a great organization to benefit,” she said.